Welcome to School of Prayer Saturday! Congratulations if you have participated all week in our school of prayer. You have learned a Bible Verse, Confessed your sins, studied the Word of God, Fasted and learned how to cast down fear. You should pat yourself on the back. I hope will come back again to learn how to deepen your spiritual walk with the Lord. 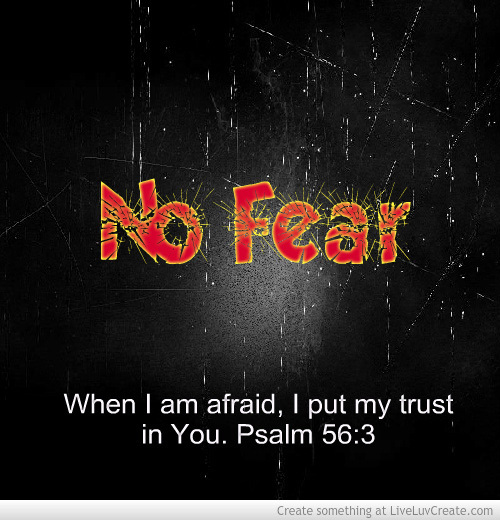 Today I will give you 10 Bible verses on fear. If you are troubled with fear, then I recommend printing out this list and reading it over and over until these verses become a part of you. The best way to battle fear is with the knowledge of God’s Word. He is the one who can take away your fears. You can turn these scriptures into a prayer to the Lord. Don’t pray for just yourself, but remember to pray for our military and their families. Whenever I pray for something for myself, I also like to pray for others who might have this same problem. The Bible says, “Faith comes by hearing and hearing by the Word of God”. I pray that these verses will help build your faith and learn to trust the Lord when you have fear. Have a great weekend from Prayer in Every City.